On The Flash, Thawne is portrayed primarily by Cavanagh and occasionally by Letscher. He is introduced in season one as Barry Allen/The Flash's archenemy from the distant future known as the Reverse-Flash. When his plan to travel back in time to kill Barry as a child was foiled by the Flash of 2024, Eobard murdered Nora Allen and framed Henry Allen instead, inadvertently severing his own Speed Force connection and stranding himself in the 21st century. Eobard then killed Dr. Harrison Wells and assumed his identity to found S.T.A.R. Labs and build a particle accelerator with Cisco Ramon and Caitlin Snow, thus creating metahumans and turning Barry into the Flash. Having regained his own powers, "Dr. Wells" feigns paralysis as he pushes Barry to run faster in hopes of using his protégé's pure Speed Force connection to travel back to the future. 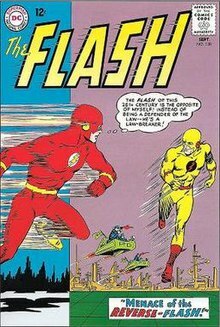 After his secret is discovered, Eobard is captured by Barry, Oliver Queen, and Firestorm. Eobard then offers Barry a chance to travel back in time to save his mother in exchange for a time sphere to return to the future, but Barry ultimately refuses and destroys Thawne's machine. As Eobard prepares to kill Barry, his ancestor Eddie Thawne commits suicide and seemingly erases him from existence. Thawne's origin is expanded upon in season two: Once a scientist who recreated the accident behind Barry's powers, Thawne developed an intense hatred towards his former idol after learning via time travel that he was destined to become the Flash's nemesis. Eobard manages to survive his erasure due to time travel vagaries and returns in season four during the 2017 crossover event "Crisis on Earth-X", where he travels to the eponymous parallel world and forms an alliance with the Nazi doppelgängers of Oliver and Kara Zor-El there in an attempt to conquer Earth-1, only to escape while his inter-dimensional allies are killed by the heroes of Earth-1, Earth-38, and Earth-X. In the 2018 crossover event "Elseworlds", Thawne appears as a fear gas-induced hallucination in Gotham City's Arkham Asylum. In the show's 100th episode, Thawne is revealed to be orchestrating season five's events from Iron Heights Penitentiary death row in 2049; he is the secret mentor of Nora West-Allen who convinced her to travel back in time to meet Barry in exchange for help in executing his master plan, eventually teaching her how to tap into the negative Speed Force.